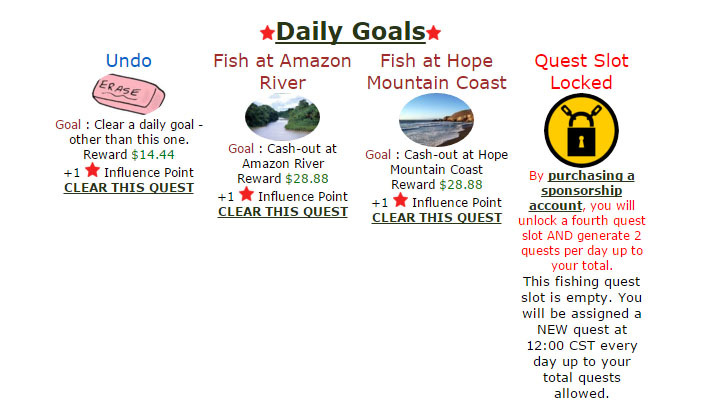 The daily goals system(“quest system”) was introduced for Trophy Fishing Online 2 on 11/30/2015. The purpose of this system is to give independent daily quests to players based upon their own skill levels with varying rewards and slow progress for certain rewards. It takes roughly 30 days(15 with a sponsorship) of quest completions to reach most of the reward tiers while some quests delay such as the “Undo quest” but are helpful in removing unwanted quests while receiving some money/influence points. Goals are generated at 12:00 CST. If you have a SPONSORSHIP account, you will generate 2 quests per day instead of 1. Without a sponsorship, you can store up to 3 daily goals(3 days worth of generation) or with a sponsorship account, you can store up to 4 daily goals(2 days worth of generation). You will NOT generate goals IF you are currently full. Goals have NO time limit for completion. The influence point system introduces another form of currency that is like a “light” bonus point. It is HIGHLY time dependent with a maximum rate gain of 2/day(with sponsorship) or 1/day without. It can ONLY be used for limited purchases from the Goals section of the game. One of the more difficult goals, you complete this by playing the Cache Jackpot Minigame. Fortunately as of 2/9/2016, there is many ways to accomplish this either intentionally or through luck. This goal type is to fish at target location based upon equipment investment levels for a player. For new players, this is ALWAYS the level 1 flyfishing area. Visit any level 0 area and cash out. Useful with vacation tournaments/goals to not waste a boat launch. Beat your OWN league placement fish. Difficulty : Varies. Can be easy if no fish are placed/early in league rotation. Catch a boss I or higher fish. Difficulty : Varies but fits in with most goals. Cash-out at ANY location on a specific day of the week. Difficulty : Varies. Easy but may require waiting.